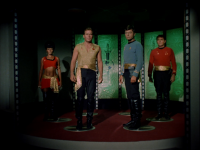 - This is the first episode to feature the mirror universe. It won't be seen again until Star Trek Deep Space Nine. - This episode was nominated for the 1968 Hugo Award for Best Dramatic Presentation. - The transition into the mirror universe. 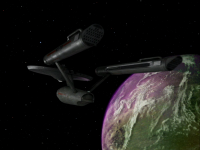 - I love the new militant look on board the evil Enterprise. - Evil Chekov betraying the captain. - The computer telling good Kirk that he succeeded to command of the Enterprise through the assassination of former captain Christopher Pike. - Evil landing party in good universe. - Evil Spock telling good Kirk of his orders to kill him. 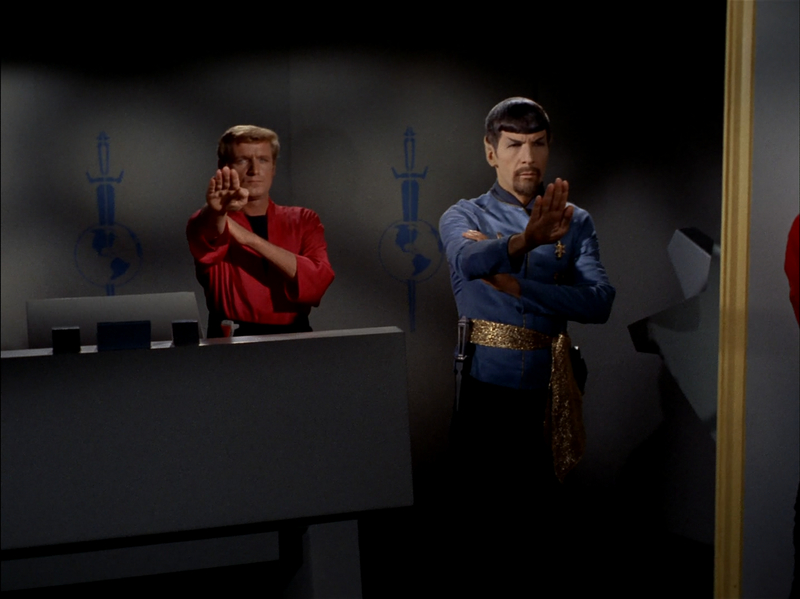 - Evil Spock threatening evil Sulu. 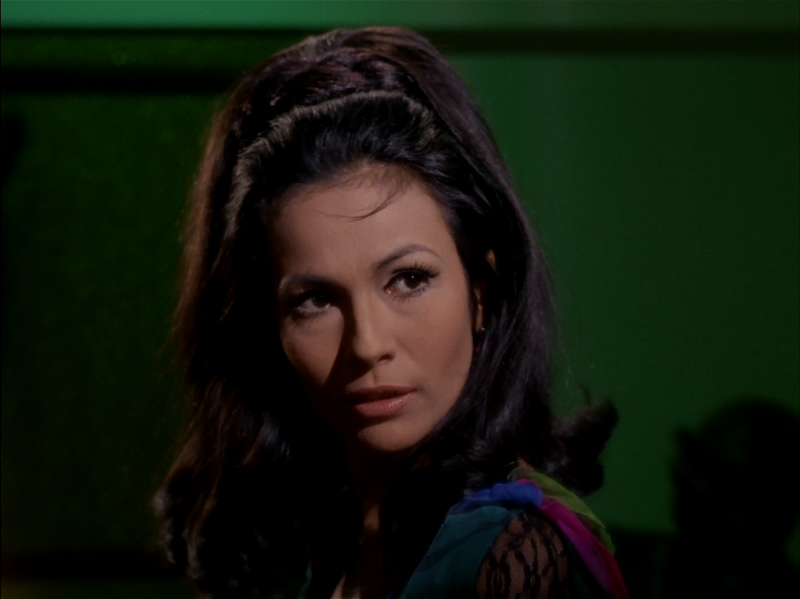 - Good Uhura seducing evil Sulu and then turning a knife on hm. - Evil Spock taking on the entire landing party. 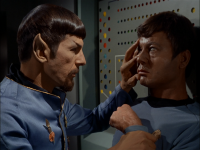 - Evil Spock mind melding with good McCoy. - Good Uhura disabling evil Kirk's girlfriend. - Spock, a man of integrity in both universes. - Good Kirk trying to convince evil Spock to lead a revolution against the Earth Empire. - McCoy, regarding Spock: "I think I liked him with a beard better. It gave him character." After a painfully banal opening scene featuring yet another alien race that looks exactly like humans (except for a dot on their foreheads...), the landing party beams up into pure awesomeness: the mirror universe. Then after a brief moment of stilted dialog in which Kirk jumps to conclusions way too quickly about the exact nature of their predicament, the episode soars forward on this absurd premise masterfully extracting well executed comedy and even an inkling of terrific drama from an episode that turns out to be far more entertaining than it probably should be. The irresistible fun of this story is mentally noting all the subtle differences in this parallel universe where the Federation is instead the Earth Empire and Kirk is a conqueror instead of an explorer. The bewildered landing party does an excellent job adapting to their new roles and slowly scheming their way back to their own universe all the while taking the audience for a wild ride filled with hysterically treacherous asides. My favorite detail of this story is the extensive use of secondary characters. 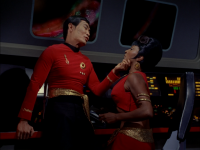 Uhura beats people up, Scotty sabotages things, and Sulu turns into a violent womanizing villain. Kirk's performance is the centerpiece of the story though. I can't help but admire his obvious inability to take any of it seriously. He acts as though throughout the entire episode he's questioning whether or not it's all some kind of freaky dream. Every time he sees another twisted absurdity he just shrugs it off with bemused amusement and it is perhaps this total detachment from the reality he ever so briefly inhabits that allows him to so nonchalantly persuade evil Spock to begin inciting a revolution. The only thing saving this delightful romp of a story from a perfect score is a few brief moments of weak writing. 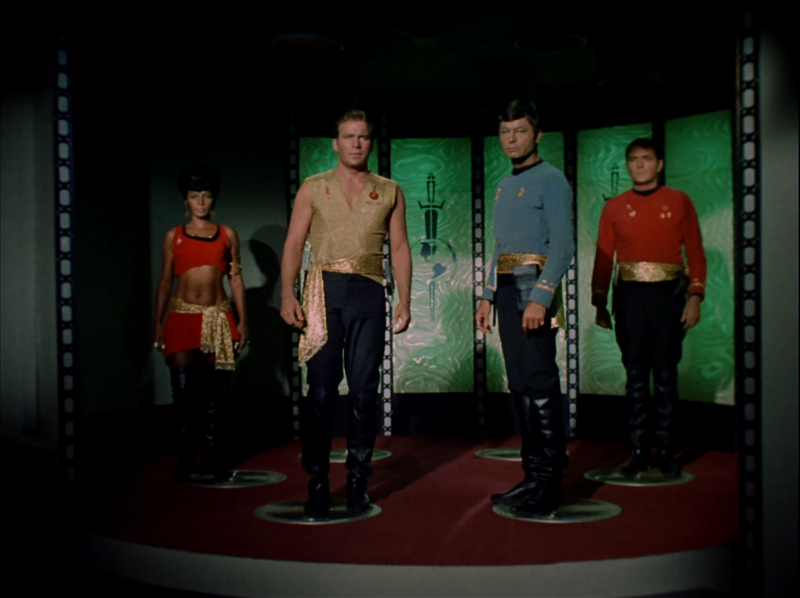 Aside from the aforementioned unambitious makeup for the aliens of the week (who themselves for some reason are identical in demeanor in both universes) and Kirk awkwardly leaping to conclusions about being in a mirror universe (not to mention the computer just automatically confirming his hypothesis somehow as if computers know everything), Kirk's scenes with his counterpart's girlfriend were also a bit weak. I never really bought her motivations for helping the landing party, although I suppose if we just assume she's not very smart it works out well enough. Likewise, the whole bit about the "Halkan prediction of galactic revolt" was a bit hard to swallow. I have a hard time believing that some sociologist somewhere has come up with a scientifically plausible theorem for quantifying a mathematically exact maximum possible lifespan for imperialistic, expansionist empires. 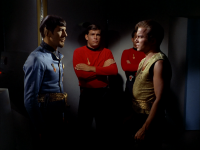 A better ending scene in the mirror universe would have had Kirk use some other rationale to convince evil Spock that he had a shot at overthrowing the empire. 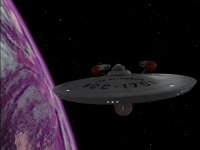 The scene is nevertheless effective anyway and the episode as a whole stands out as among Star Trek's most entertaining stories so far. To me, the ending of this episode isn't an ending, it's a cliffhanger. I want to see what happens next! Well done. I found a problem with this episode, only one however. If the mirror universe is parallel, then why are the aliens in the mirror universe also peaceful pacifist? Shouldn't they be as ruthless as the Federation, more so even? Ah, so you are revising your ratings (this used to be a "7", and now it's a "9"). By the way, this is not a criticism; I would be doing the same thing! Anyway, this is indeed a classic but I agree that there a few minor niggles that prevent promotion to a perfect score. 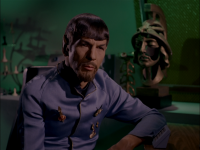 Spock, arguably the most intriguing science fiction character ever created, is thrust into the situation where he alone has to ignite the struggle to reconnect all of humanity to its human values. That is a deliciously ironic premise, and may be the most interesting unexplored Star Trek idea ever. This would have been a very interesting story, albiet one that would have required an entire season to have told properly. Obviously, bad Kirk has to go back to his quarters to find the Tantalus Field is missing. He’s not converted to bearded Spock’s cause, he doesn’t even know Spock has one, but he is cornered and careful because whoever stole the weapon can make him disappear at any time. Spock has to reach out one by one around Kirk and reestablish the ‘normal’ bonds of loyalty with the other crew members. Seems to me that McCoy is first ‘recruit’, in part because he is the one that will be the most idealistically inclined, in part because he’s already mind melded with ‘good’ McCoy, but mainly because he is the least corruptible to darker influences. 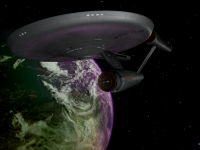 Each character will have different ways for Spock to reach them. But in order to overthrow the empire, he has to have Kirk, because only Kirk has the abilities to pull it off. Kirk is the most strong willed, the most capable of deception, and therefore the most dangerous to approach. Then, once Spock has his rebel crew lead by his rebel captain, somehow just this one ship has to go on to ignite freedom in the galaxy. Ah, what a delicious tale this would have been. Mirror Mirror - a stroke of genius and a genuine ‘10’. Factoid: The leader of the Halkan council was played by Vic Perrin, who also played the voice of Nomad in "The Changeling"! Notice that after the opening title sequence, the Enterprise is orbiting the planet in the opposite of the usual direction! The planet's rotation is also reversed, at least based on a few spot checks I just made. But, as usual, the planet is rotating way too fast. 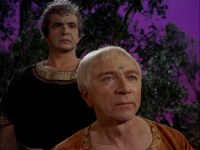 The Halkans reasoning in denying Kirk the di-lithium crystals is just plain dumb. SCOTT: I've been ordered to check phaser couplings for possible damage by the storm. GUARD: Do you have authorization from security, sir? 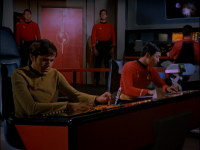 GUARD: I'll have to check with Security Chief Sulu, sir. SCOTT: Never mind. I'll attend to it. 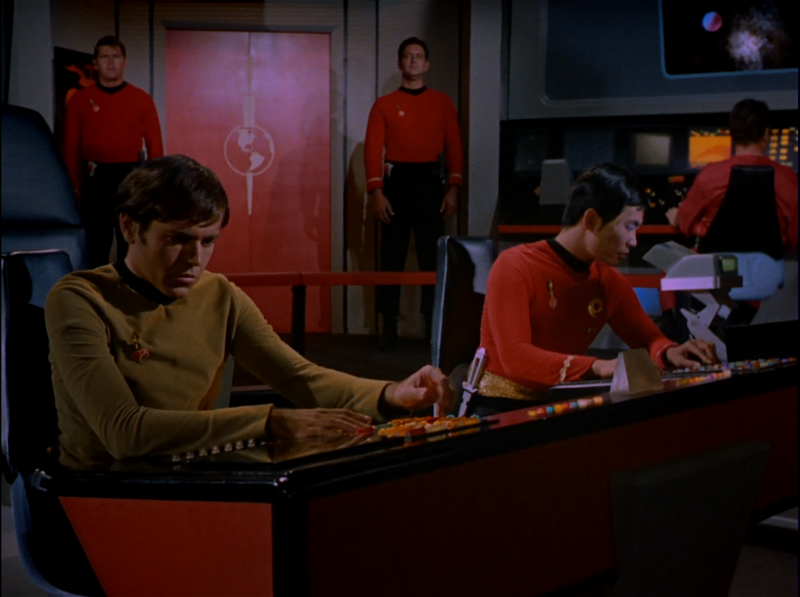 OK, since when does the chief engineer need authorization to check the phasers? Why are the Halkans the same extreme pacifists in the mirror universe? Well, it's clear that the anti-symmetry is not exact (witness Evil Spock's goatee, e.g. ), so this must be one of the larger aberrations, sort of like non-conservation of parity of just a miniscule percentage of phenomena in our own universe. (Conservation of parity in physics means that the mirror image of any possible process is also a possible process. Astonishingly, albeit for only a very few processes, such as beta decay, this is not true. Hence the Halkan aberration is somewhat analogous to non-conservation of parity. Why does Marlena "disappear" every one of Sulu's cohorts except Sulu himself? 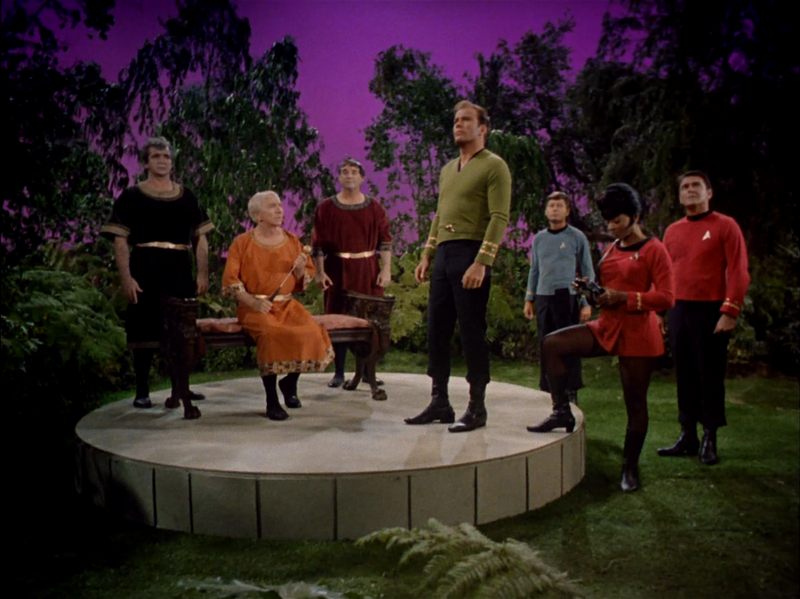 I love scene with Spock's and the evil gang of four, esp. when he says "fascinating." The scene with his commentary on them at the end of the show is also quite good. Re your command about the "Halkan prediction of galactic revolt": Check out Isaac Asimov's _Foundation_ series with Hari Seldon's "psychohistory," which allows one to make useful, though probabilistic, predictions of large-scale events. So one can view it like that, though I'm not so sure the Halkans could perform such calculations! Awesome. 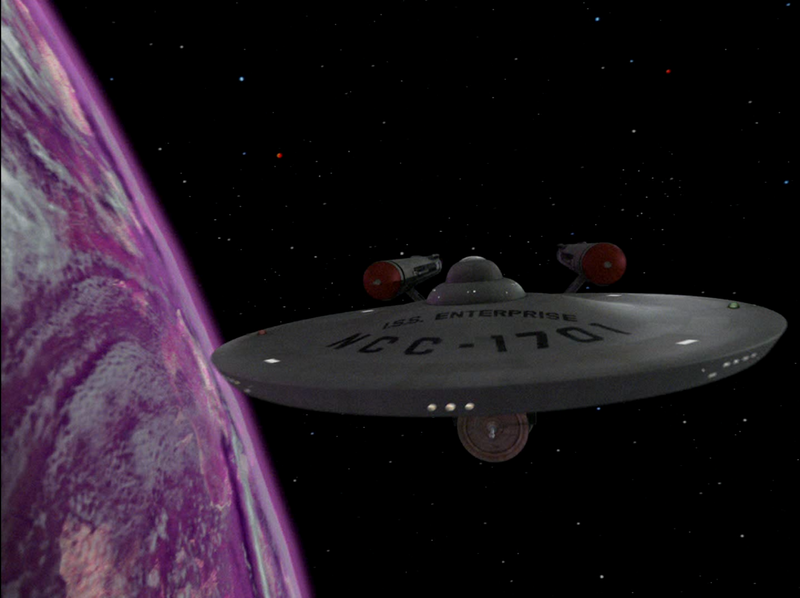 Though it's partly due to the music (as is quite often the case), only Shatner could do it so well. I gave this one 8/10. Really entertaining episode. The problems I had with this one "mirror" those given by other posters, especially Alan (above). The one that probably bugged me most was the interaction with the computer, which, as Kethinov has pointed out, is ridiculously capable. It would seem that nearly any question about astrophysics, theoretical or not, can be handled by this thing. It would seem to make engineers virtually worthless. Bye-bye, Mr. Scott. Nonetheless, the story and characters are wonderful to watch here. The subtleties are intriguing, of not completely consistent. The notion of parallel worlds has enough plausibility, and the story was written just intelligently enough to keep a viewer's brain engaged throughout.